At the closing of its regular session on December 10, the National Assembly failed to pass the “proposed amendment on 3 Acts to stop corruption at kindergartens,” in relation to the Preschool Education Act, the Private School Act and School Meal Service Act. 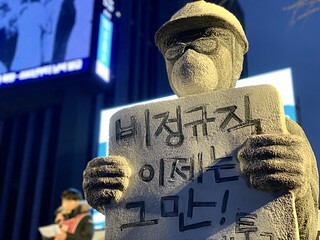 Obstruction by the Liberty Korea Party has been getting in the way of the passing of this legislation, as the party seeks to shield the Korea Kindergarten Association. 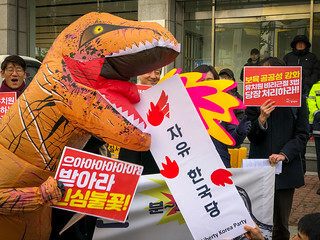 On December 5, PSPD held a press conference in front of the Liberty Korea Party headquarters, criticizing the party’s attempts to delay the proposed changes, by introducing their own amendments. 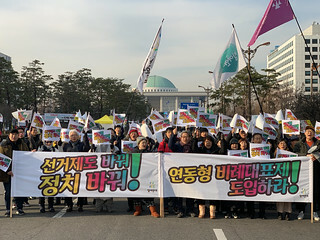 After the discussion session we held a press conference in front of the National Assembly gates, alongside Minbyun Lawyers for a Democratic Society, the National Parents Emergency Committee for Kindergarten Corruption, the True Education Parents’ Association and the Korean Teachers and Education Workers Union (KTU). Such protests will continue until the three legislation changes to root out kindergarten corruption are passed. Rapid changes in the Korean peninsula, since the Pyeongchang Olympic Winter games, were welcomed. The meeting discussed the role of civil society in establishing a peace regime on the peninsula, as well as the need for denuclearization in Northeast Asia. 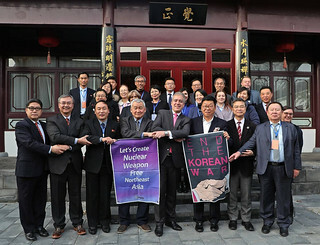 Participants reaffirmed the importance to global peace of peace on the Korean peninsula and in Northeast Asia, committed to continuing cooperation among organizations for peace in the region. 2018 marked a breakthrough in the pursuit of peace on the Korean peninsula, with the holding of three inter-Korean summits and one North Korea-US summit. We expect greater steps towards peace in 2019. A fire that broke out at the KT Ahyeon office in late November last year, severely disrupted the lives of many people in Seodaemun, Yongsan and Mapo districts. Not only were mobile, broadband and landline networks brought down, but credit card networks and some emergency telephone lines were also affected. The direct impact of communication disruption is important, but what appears to be a bigger problem is the indirect losses suffered by local businesses, which are more difficult to fully compensate. This accident showed not only how deeply telecommunication affects our daily lives, but also how critical it is to secure public telecommunication services. 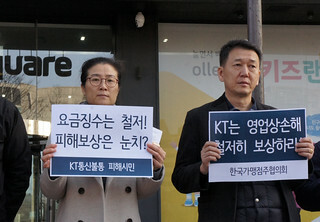 PSPD held a press conference in front of KT’s Gwanghwamun office on November 28 to demand the following in regard to the KT incident: Enhancing public communication services by securing a better back-up system and conducting a full inspection of the existing system to ensure this kind of incident is not repeated; preparing compensation plans for consumers, retail owners, delivery workers and substitute drivers who were affected; and reinforcing consumer protection measures through the introduction of class action lawsuits. On December 6, PSPD, together with other civil society groups argued that the root cause of this incident are the increasingly profit focused principles of KT since its privatization, including the downsizing of its workforce by tens of thousands of workers, increasing outsourcing, and a decrease in investment in safety measures. Reinforcing public communication services were also demanded at the press briefing. On December 10, PSPD continued its efforts to point out that the compensation proposals by KT were insufficient, and urged a true apology, proper compensation for the victims, as well as measures to stop this from being repeated. The following people were awarded the ‘2018 PSPD Righteous People Award’: Kim Jong-baek, who gave testimony and evidence to help prove that the former president Lee Myeon-bak, was the de facto owner of DAS; Chae Dong-young, who provided information on the involvement of ex-president Lee and Samsung in a DAS slush fund and the collection of BBK investments; Jeong Mi-hyun, who provided information on the irregular accounting practices of Hanheung Academia and Seoul Art high school; prosecutor Ahn Mi-hyun, who revealed the weakness of the prosecutor’s office investigations into recruitment corruption at Kangwonland, and the political pressure to cover this up; and Judge Lee Tan-hee who paved the way to reveal who was behind judicial corruption by rejecting working on a ‘blacklisted judges’ case and submitting his resignation. The Righteous People Award has, since 2010, been given out in December each year to applaud the bravery and devotion of individuals who provided information or reported on abuses of power, the wasting of budgets, violation of the law by corporations or private institutes, or who fought against the regression of democracy by such actions. On December 7, over 100 guests, including award winners, their family, past winners and whistle-blowers, joined the award ceremony, along with Jeong Kang-ja, the co-leader of PSPD. PSPD thanks all the 2018 award winners who refused to bow to injustice, who uncovered the truth, and who made our society more transparent. In January 2019, the five major parties in the National Assembly agreed to pass an electoral system reform bill that included changes to proportional representation. Leader Son Hak-kyu, from Bareunmirae Party, and Leader Lee Jeong-mi, from the Justice Party, ended their fasting, and a small victory was celebrated for the fireworks gathering. However, before the ink had even dried on the bill, the Liberty Korea Party started making comments rejecting the agreement. The Democratic Party of Korea has also been somewhat hesitant in its approach to electoral system reform. As a ruling party, the Democratic Party must support the political reform. Political reforms that reflect the will of the people, including electoral system changes, are not meant to benefit any one political party. The new system will allow minority votes to have their representatives in the National Assembly, as opposed to the current single-member constituency system which does not let minority votes to be represented. Every citizen will benefit from such political reforms. Kim Yong-kyun, an irregular worker at the Taean power plant, died in an accident while inspecting a piece of machinery by himself in the early morning of December 11. Promises to make this country a safer place since the Sewol ferry tragedy of 2014, have been put to shame. This was not the first time that outsourcing practices, in the pursuit of maximizing short term profits, has resulted in tragedy. A maintenance worker at Gangnam subway station died in 2015, another maintenance worker died at Guui station in 2016, a crane worker hired by Samsung heavy industry’s contractor died in 2017, and more recently workers at a logistics center of CJ Daehan Express died in 2018. Proposed changes to the Industrial Safety and Health Act, which would prevent outsourcing critical work, have not been passed by the National Assembly and the government has been slow in ordering administrative actions to ensure health and safety at work. The tragic death of a subcontract worker who was ‘outsourced for risky work’ was no surprise. PSPD participated in the ‘Emergency committee to investigate the tragedy of the late Kim Yong-kyun and to hold those who were in charge responsible at Taean power plant.’ We also joined the memorial service for the deceased at Gwanghwamun on December 22. In addition, PSPD issued a letter to all representatives of the Environment and Labor Committee of the National Assembly on December 21, urging the speedy evaluation and passing of the proposed changes to the Industrial Safety and Health Act, including: banning the subcontracting of high risk original contract work; expanding the responsibilities for safety and protection management placed on the original contract; imposing penalties for deadly accidents on the employer of the accident site; and holding contractors more responsible for preventing industrial accidents. We urged the speedy passing of the amendment within the year 2018. Once again, we reiterate our deep sadness over the death of Kim, Yong-kyun. His tragic death must not be repeated any more.